This Instant Pot Ham is SO juicy and couldn’t be easier! Much faster than the oven, and drizzled with a simple, sweet pineapple glaze. We’re cutting it a bit close here (Easter is just a week away! ), but I still needed to share this Instant Pot Ham recipe. I honestly wait and wait until the hams start popping up in grocery stores (we’re talking what I like to call “real” ham, or bone-in ham) — the whole family loves ham and I love that it’s so easy to cook. 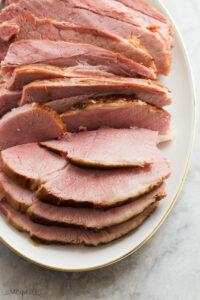 If you’re hosting this Easter (or Thanksgiving, or Christmas…), this pressure cooker ham is really the way to go. It’s so ridiculously easy to make (and so hard to mess up!). 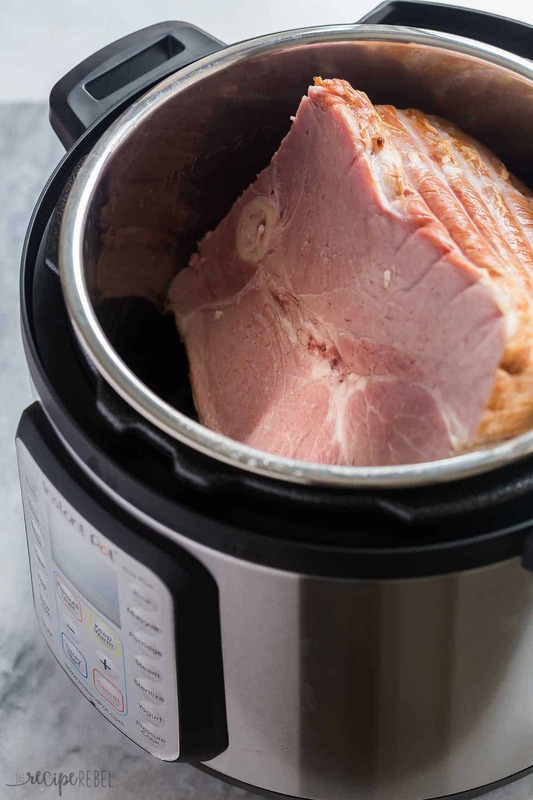 There’s no real cooking here, we’re just using the Instant Pot to heat our ham (since hams come fully cooked), and while that happens we’re going to reduce some pineapple juice with some other key ingredients to make a simple, sweet ham glaze. Now that we’ve got the star of the show covered, what are you going to serve with it? Since our ham is totally hands-free (aside from whisking our glaze every now and then), we’ve got a little more time to make this ultra creamy Cream Cheese Mashed Potatoes and or throw these Crockpot Cheesy Potatoes in the slow cooker and put your feet up until the guests arrive! Choose your ham. 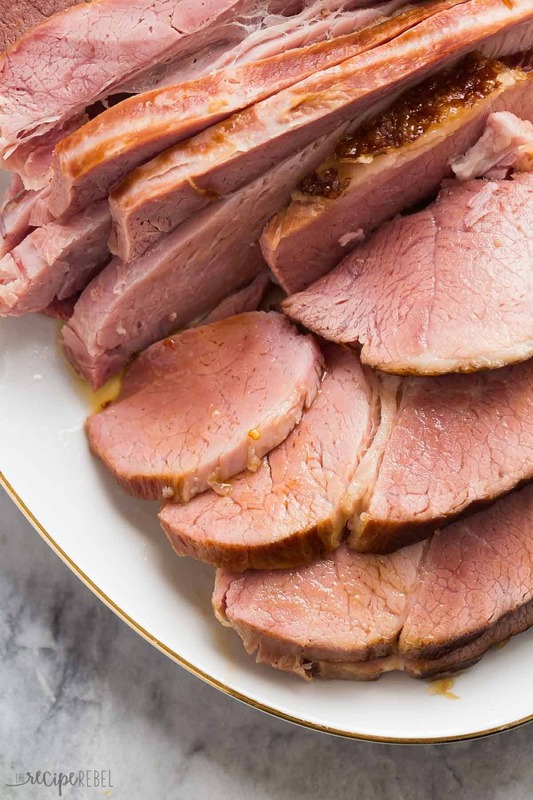 You can absolutely cook a spiral ham in your Instant Pot, but I prefer regular bone-in ham for this recipe because a spiral ham can be difficult to remove after cooking, which leaves the presentation lacking. (If you’re going the spiral ham route, reduce the cook time to 5 minutes and do a full natural release). Find a ham to fit your Instant Pot. Or…. make it work 😉 I had to cut my ham to fit in my Instant Pot, which doesn’t bother me at all as I can throw that extra chunk in the freezer for a quick meal another day. My ham was 4.6kg (10lb) to start, and I cut off the end to fit so it was 3.9 kg (8.6lbs) in the end. If you can, look for a ham that’s more circular than oval and around a size of 8 lbs for an 8 quart Instant Pot, or 6-7 lbs for a 6 quart Instant Pot. Choose your liquid. I love pineapple with ham, so I used pineapple juice. You can absolutely swap for chicken broth, water (though it won’t add any flavor!) or even apple or cranberry juice. Don’t overcook. A ham of this size can take 2-3 hours in the oven, so it can be tempting to cook a ham for longer than necessary in the Instant Pot. However, 15 minutes is plenty, especially with the time it takes to come to pressure and for the pressure to release. If your ham is much smaller than 8lbs, you may want to reduce to 13 minutes. This Pineapple Ham Glaze is so super simple: we just stir together some pineapple juice, brown sugar, apple cider vinegar, salt and red pepper flakes and let it simmer. Whisk occasionally, and watch for the liquid to reduce by half. You can leave it like this, or make a corn starch slurry to thicken further. This Instant Pot Ham is SO juicy and couldn't be easier! Much faster than the oven, and drizzled with a simple, sweet pineapple glaze. Cut ham to fit in Instant Pot if necessary. Place in Instant Pot. Pour 2 cups pineapple juice into Instant Pot, put the lid on, turn the valve to sealing and select Manual or Pressure Cook, high pressure, for 15 minutes. It will take about 10-15 minutes to build pressure and begin counting down. Once the cook time is over, turn the Instant Pot off and let the pressure release naturally (this can take about 15 minutes). While your ham is cooking, combine 1 cup pineapple juice, sugar, vinegar, salt and red peppers in a small saucepan with a whisk. Bring to a boil over medium-high heat, then reduce to medium heat and simmer for 10-15 minutes until reduced by half. If desired, combine 1 teaspoon water and 1 teaspoon corn starch and stir into simmering glaze to thicken slightly.